Imagine yourself in a casino, the environment is familiar: you hear the beeping and dinging of fruit machines, dealers` voices, clatter of glasses with cocktails and noise of the crowd. You look at the dealer sitting opposite you at card table and wonder whether the casino authorities has worried about the ionization of the air with additional portion of oxygen in order to keep players cheerful and active? Instead of chips you see a touchscreen in front of you. Using it you can control your expenses from your new digital account, place bets and make other necessary transactions! Sometime later you feel tired of online blackjack and you are willing to change the game. 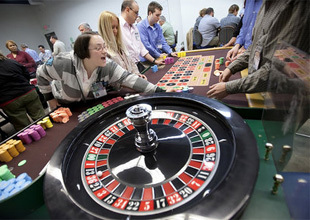 You choose roulette, and table in front of you is changed to another panel, so you do not even have to move! You place the bet and follow the ball that flies through roulette pockets. Few seconds later you hear your name and find out that your number has won the jackpot! Few minutes pass in hysterics and you turn to robotic waitress that congratulates you with a welcome cocktail from the betting house. All right, let's make it without electronic waiters. Further development of this scenario is quite evident for the nearest future. Best casinos are about to practice additional innovative security options in order to educate more stuff, employ more sophisticated senior management and IT specialists, renew existing banking methods and invite third-party games developers. Recently increased power of computers will result in more complicated video viewing system. Coaches from all over the world will train stuff to identify cheaters and prevent any potential fraud attempts. Intruders will get warnings and even will be banned from casinos. Cashing out system is subjected to changes. Ticket-voucher systems are already working for certain gambling games like slot machines or video poker. Casino visitor's winnings will be given out in tickets but not in coins, cash or other alternatives. This trend is interesting as far as it will lead to cash inventory reducing along with less stuff to proceed, trace and secure that cash. All of the above mentioned advances are underway and can be already noticed at some leading and progressive gambling establishments that already adopted some innovations in gambling. In order to survive and attract even more casino-goers betting houses are going to come up with a completely different type of experience and fountain of new ideas. Gambling houses do their best in order to satisfy various interests of new generation of players because the stakes in the gambling business are actually very high.